While we’re still waiting on the fifth-generation Moto G to arrive here in Canada, it appears Motorola and parent company Lenovo plan to release even more low-cost devices this year. According to a new report from Evan Blass, the company will release two new devices sometime later this year called the Moto C and Moto C Plus. The more compelling of the two devices, the Moto C Plus features a five-inch 1280 x 720 pixel display, 64-bit quad-core MediaTek chipset clocked at 1.3GHz, 16GB of expandable storage and a massive 4,000mAh battery. Depending on the region, the Moto C Plus will ship with either 1GB or 2GB of RAM. It’s also expected to include an eight-megapixel rear-facing camera with autofocus and flash, as well as a two-megapixel selfie camera. Then there’s the Moto C. Like the C Plus, it will feature a five-inch display. However, it’s a lower resolution screen that caps out at 854 x 480. The Moto C is also where things get complicated. According to Blass, Motorola will ship two different variants of the device: one with a 3G modem and another that’s LTE capable. The 3G version will ship with a 32-bit quad-core MediaTek chipset clocked at 1.3GHz, 1GB of RAM, either 8GB or 16GB of expandable storage, a five-megapixel rear-facing that doesn’t have auto-focusing capabilities and a two-megapixel front-facing camera with flash. 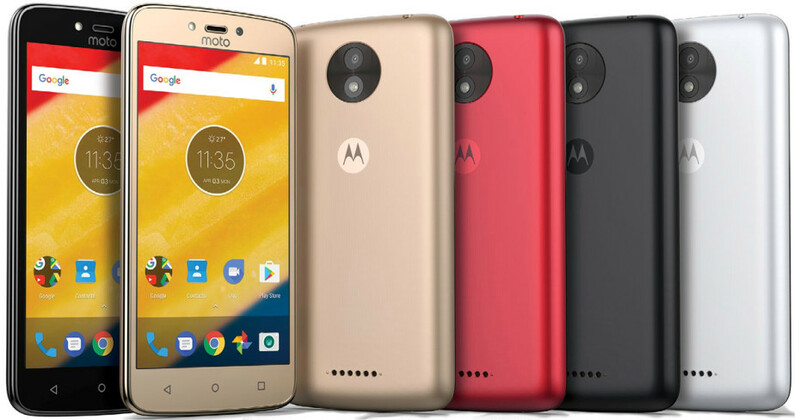 The 4G version, meanwhile, improves on the base model Moto C by adding a 64-bit MediaTek processor clocked at 1.1GHz, support for LTE wireless speeds and a back-facing camera that support auto-focus. Both phones will ship with Android 7.0 and a small 2,350mAh battery. Each model is also expected to ship in a variety of colours, including gold, red, black and silver. No word on whether Motorola will release the two devices in Canada. However, it seems Motorola will target developing markets with the Moto C and Moto C Plus.